If they ask, “What BRICS is about?” the answer will be: “BRICS is about the world order”. It creates its own structure of global governance. Therefore, this group should offer the world an alternative model of socio-economic development based on the market and new technologies, but different from the current system that assumes the dominance of the West. The BRICS sceptics criticize it because of three main reasons: first, the member countries lost the economic dynamics, second, there are growing economic and political contradictions between them, and third, these countries have different political conditions, so the union is “collapsing”. Considering economic statistics, some believe that BRICS is a star-shaped China-centered structure, because all the countries' trade with it is much more than with each other. Thus, a question arises, whether BRICS is only a platform to promote China’s interests and its project to reconstruct the entire world. These are very sly statements. The Chinese factor is only one of the BRICS development facets. During the discussion at the Valdai Club on July 19, 2018, Minister of Economic Development Maksim Oreshkin noted that all countries contribute to the BRICS, so its common denominator is a consolidated position of all member states. Their interests could be different, but they are united in something, and that is the position of BRICS. The common denominator grows as time goes on, and now, because of the turbulent global situation, it is especially important. In comparison with the G7 BRICS expresses a touching unanimity, which is not faked. This is not a “mutiny on the ship” we see with the G7, when the captain led to one direction while the crew wants to go to another one. After the Chinese chairmanship, which was very successful and ambitious, the chairmanship of the two southern BRICS members (namely, South Africa and Brazil) is a kind of “plateau”. Naturally, both countries do not have such resources to promote the projects while being at the chairmanship, and both have a complicated political situations. Therefore, if the dynamics of BRICS development in the two years remains, it will be great. Russia needs to accumulate forces to make a qualitative leap in 2020, when the chairmanship will be ours, so by that time BRICS could become a united center of the multipolar world - the multilateral pole of the multipolar world. The member countries should coordinate their policies and economic strategies, find concrete forms of interaction and participation in global governance that will enhance their role. Now BRICS creates its own structure of global governance, and it must develop in that direction. I do not know, whether that could be accomplished in the context of growing counteraction from the West, but we have to keep working. BRICS is a global organization. If they ask, “What BRICS is about?” I will answer: “BRICS is about the world order”. These five leading ascendant powers could create a world order that will be more just and balanced than what we see now. Do we have to expand this format, to include new countries? We will not go along this path yet, but what we see in the BRICS+ format, which is involving the largest countries that are not the group’s members, but show interest to it, is a significant step towards increasing the BRICS value and making this union a representative of the greater part of humanity. On the eve of the Johannesburg summit the participants of the Valdai Club discussion said, that BRICS is not “against”, but “for”: for just economic development conditions, for sustainable development concept to be centered on human beings, and not just on the mechanisms of a liberal market or profit gaining. 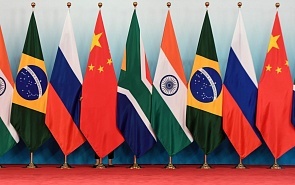 BRICS should offer the world an alternative model of socio-economic development based on the market and new technologies, but different from the current system that assumes the dominance of the West not only in technology, but also in finance and the economy – which in general seems to be artificial.